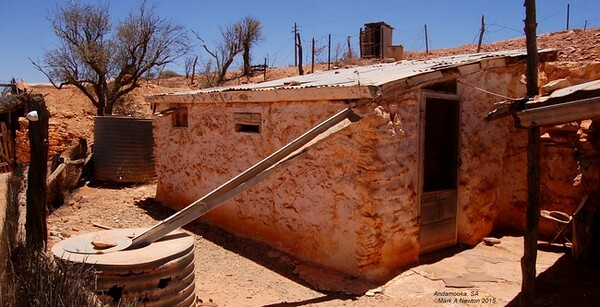 Burrowing ability allows U.yaschenkoi to successfully inhabit an arid environment. Survival in a desert environment is difficult for any organism, U. yaschenkoi's successful adaptation to arid conditions has allowed it to attain large population numbers and be one of the most common organisms to inhabit Australia's interior. Found from South Eastern inland Australia, diagonally across the interior to the North West coast. The studies I have conducted on this species were made North of Berri in South Australia and only directly relate to those animals. U. yaschenkoi almost exclusively inhabits sandy soil country - there are areas where hard soil meets sandy soil, at this point it's clear the species is virtually non-existent in the hard soil, while being plentiful a few metres away in the sandy soil area. It's that clear cut, the vegetation changes from Eucalypts, Triodia irritans and small shrubs in the sandy soil conditions to predominately Casuarina pines and bluebush in the hard soil areas. Pockets of hard ground occur within the sandy area and vice versa, either way U.yaschenkoi only exploits the sandy soil type with very few individuals occurring in the zone of overlap. It would appear as though fitness of the animal is significantly reduced within the harder soil type. Lets take a closer look at the burrow. The entrance to the burrow is called the entrance chamber with an angle of entry around 15-45 degrees below ground level. The length varies, being longer in younger instars and shortest in adults. 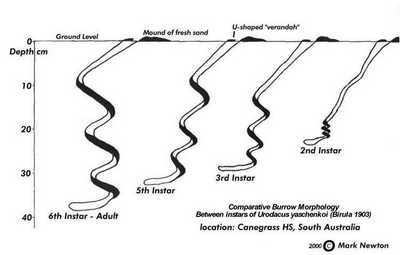 Width of the entrance at the mouth ranges from 20-35mm. Following the entrance chamber are the spirals, these vary in number and direction of rotation - anything from 1-4 turns, with 2 complete 360 degree turns being common. Sometimes when things such as tree roots get in the way or for no apparent reason, the scorpion will change direction of the spiral. 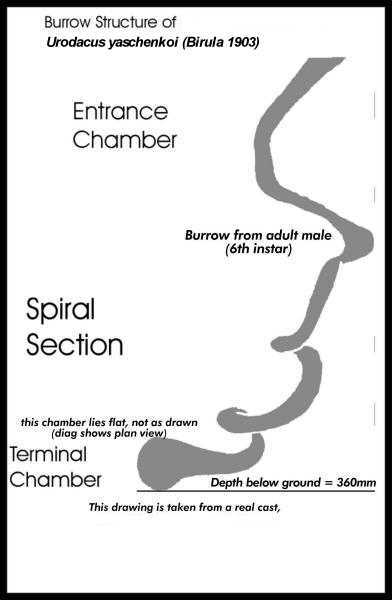 The final section of the burrow is the terminal chamber where the scorpion spends most of its time, this area is the "living" area and hence is large enough to move around easily in - it's highly variable in length, sometimes has an additional side chamber and is the deepest point of the burrow. In the individuals I have studied, terminal chambers varied from 200mm to 450mm below ground level. I believe burrows found in drier areas can reach 1000mm or more in depth. Age-specific relative burrow structures with adults on the left, youngest right. The spiral burrow is a type of burrow constructed by various species of Urodacus and African Opistophthalmus. There have been no conclusions drawn as to the benefits of this architecture, however considerations may be: increased difficulty for predator excavation; water vapour entrapment; greater insulation from the surface environment. The image left shows a generalised burrow structure for each of 4 different age instars, adult on the left to youngest on the right. The 5 different instars that dig burrows, instars 2-6, all dig to a deeper depth than the previous instar, and all dig burrows with the same three components, entrance chamber, spiral section and terminal chamber. An adult scorpion burrow cast, a little atypical of most.